Martha from A Sense of Humor is Essential here to fill in for Joanne and to share a special shortbread recipe that is easy to make, with ingredients readily at hand, and has a nice, not too sweet taste, which goes wonderfully with coffee and tea. These cookies are also always a hit at baby showers, bridal showers, and as hostess gifts too. 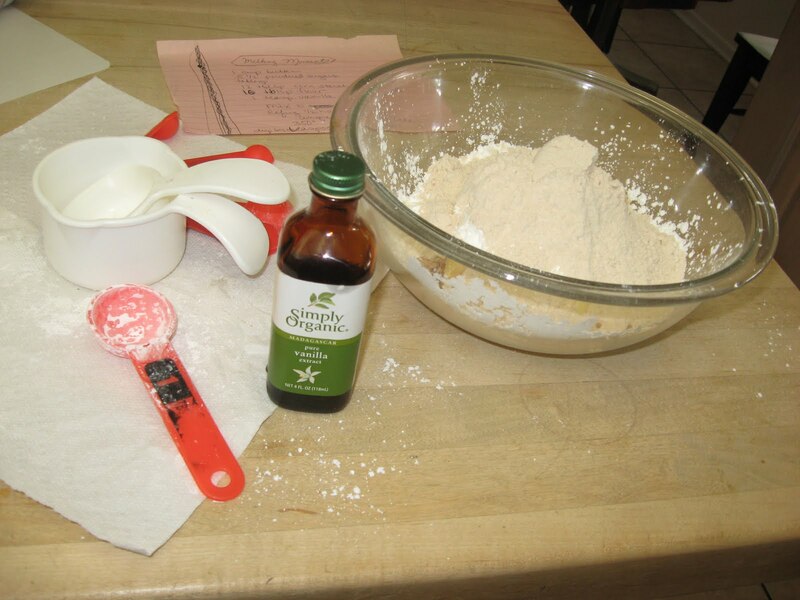 Mix all ingredients using mixer for approximately 3-5 minutes until a soft ball dough is formed. 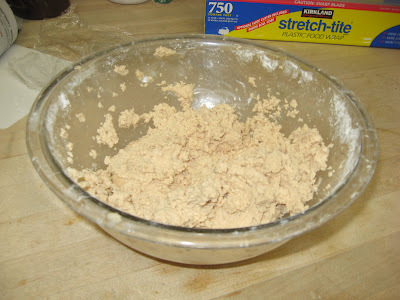 The dough will look like cornmeal prior to the dough ball forming. Drop by teaspoons unto un-greased cookie sheets. Bake until golden at edges, approximately 12 – 15 minutes. 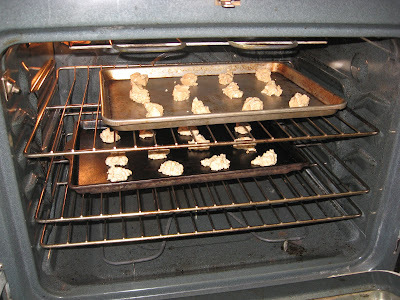 Allow cookies to completely cool on cookie sheet. Frost with glaze or frosting if desired. Refrigerate if necessary. This is my farewell post here on Our Krazy Kitchen. Life in the Harried Homemaker’s world has gotten busier than ever and although I hate to do it, I am cutting back on my “extra curricular” activities. Please continue to visit me over at my blog. I so enjoy the friendships that I have made during my sojourn here. As my swan song, I am simply posting pictures of all of the recipes I have posted here. You can find them under either of the titles I have used for these Friday posts (Lovin’ From Your Oven or What Did You Bake Today). Happy Baking, Friends!!! Later this week we are losing our resident baker, Kristen to her Harried Homemaker life. She has been a great asset to OUR Krazy kitchen and will be sorely missed. We wish her well and hope she’ll visit often. We are also blessed to be gaining Chris from Nibble Me This as our new resident grill master and another male voice. Dave from My Year on The Grill and right here on Thursdays for I CAN COOK THAT! is our other resident grill master, but that silly tropical island has a rule about grilling and he’s being so good to abide by it. He must be going through withdrawals by now though! 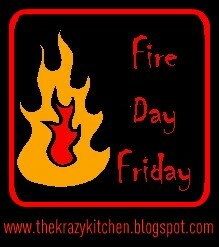 Be sure to join us for FIRE DAY FRIDAYS here at OUR Krazy kitchen. Thank goodness for good online recipe sites. My favorite two are Taste of Home and All Recipes. If I am in a cooking rut, I am almost 100% guaranteed to find something delicious there. Here is an easy meal that all the family is sure to love. Add or subtract ingredients according to your tastes. In a large skillet, brown ground beef and onion. Add salsa, olives, salt, chili powder, garlic powder and cumin. Slice the loaf of French bread in half lengthwise. Spread equal amounts of the ground beef mixture on each half. Sprinkle one cup of cheese on each half. Bake for 10 minutes at 450 degrees. Cook the hamburger with the onion. Combine the meat with the spaghetti sauce, mushrooms, and Italian seasoning. For Crockpot: Spray crock with PAM. Layer the meat sauce, then noodles then pizza toppings then cheese three times. This completely filled my large crock pot. Cook on low 3-4 hours. Here’s an oldie but goodies from my blog, Frugal Antics of a Harried Homemaker: Butterscotch Brownies. My grandmother used to make them for the school children in her town. She was the head baker for the school district back in the 1970s. They are full of butter and sugar, so dieters beware! Combine the moist ingredients with a mixer. Sift together the dry ingredients in a bowl and add to the wet. Fold in the chips. Spread in a greased 9 X 13 pan and bake 350 degrees 30 minutes or until done. My sister in law makes a killer coffee cake. It has a ripple of cinnamon through the center. The cake is buttery and moist. It’s really wonderful and my husband adores it. She has never shared the recipe. I have asked. So. I have had to search high and low for something similar. This is attempt 2,538 in twenty years. It’s as close as I have ever come to replicating it. I am not sure I am done trying, but this is a good fall-back. Combine the dry ingredients in a bowl and set aside. Cream the butter and sugar. Add the vanilla and eggs. Alternately add the dry ingredients and the sour cream. Pour half of the batter into a greased 9 inch pan. Combine ingredients in a bowl with a pastry blender or fork until crumbly. Sprinkle half of the topping onto the batter in the pan. Top with the other half of the batter and then sprinkle on the remaining half of the topping. Bake 350 degrees for about 40 minutes. Tent the cake with foil and bake another 30 minutes or until a cake tester comes out clean. Min posted a wonderful Strawberry Shortcake recipe just last week, but my schedule this week demanded a quicker version. I saw this idea on someone’s blog earlier this week. I am embarrassed to say that I cannot remember whose. If you recognize this, please let me know in the comments so I can give full credit. This week, I am hosting a Betty Crocker/Safeway giveaway over at my blog. In conjunction with that giveaway, there is a cake mix sale at Safeway. $.69!!! When is the last time you saw named brand cake mix that cheap? There was also a BOGO sale on strawberries. And I had a $25 gift card. You can see where I am heading with this, right? I haven’t described myself as Frugal and Harried for nothing. Make cake as directed in a 9X13 pan. Be sure to greased the pan well. When the cake is cool, remove it from the pan and slice it through the middle so you have two layers. Whip the cream, adding the vanilla and sugar near the end (Note: does anyone else have a fear of turning their whipped cream into butter accidentally?) Put the bottom layer of cake back into the pan. Spread it with half of the now whipped cream and then top that with half of the strawberries. Place the top layer back into the pan and repeat. Here is the neat part. The mess is now all in the pan and it slices fairly easily. The longer you wait before serving it, the more trifle like it will become as the cream and strawberries soak into the cake. I am also hosting a yogurt maker giveaway this week, so feel free to visit and enter both giveaways! Every week, I try to bake a recipe that is 50 or more years old. I have a huge box of old books, newspaper clipping and hand written recipes that belonged to my grandmother and another that belonged to an old family friend. It’s a veritable treasure trove of great recipes. This week, I just didn’t get around to posting it over at my blog , so I am posting this one over here. This recipe came from the 1950 Pillsbury Bake Off. Cream the sugar and butter in a mixing bowl. Add the eggs, one at a time. Beat for 1 minute. Combine the dry ingredients in a smaller bowl and the water and vanilla in another. Add them alternately with each other. Pour into three well greased and lightly floured 9 inch round pans. Bake 350 degrees for 25-35 minutes. (Note: If using half the ingredients, bake in a 9X9 pan for 40-50 minutes or until a toothpick comes out clean). Melt butter in a large saucepan. Add the brown sugar and salt; cook over low heat for 2 minutes, stirring constantly. Add milk and continue stirring until mixture comes to a boil. Remove from heat. Blend in powdered sugar gradually. Add vanilla and mix well. This with a small amount of milk if necessary. In my memory, tuna casserole is often dry, tuna-y and slightly gross. It’s a cheap meal, but it isn’t always something to rave about. Until now. This just may be the best darned tuna casserole you will ever eat. Blend the sour cream and soup. Add the milk and stir until creamy. Combine with all the remaining ingredients except the cheese and bake at 400 degrees for 20 minutes. Sprinkle on the cheese and return to the oven for 5 minutes or until the cheese is melted.